An appetizer: "Self-governing freemen must have the power to accept necessary compromises, to make necessary concessions, each sacrificing somewhat of prejudice, and even of principle, and every group must show the necessary subordination of its particular interests to the interests of the community as a whole. When the people will not or cannot work together; when they permit groups of extremists to decline to accept anything that does not coincide with their own extreme views; or when they let power slip from their hands through sheer supine indifference; then they have themselves chiefly to blame if the power is grasped by stronger hands." One of the most important books I've read, and a great way to finish 2006. Can you imagine a world without poverty? Muhammad Yunus has, and he has created a way that is making this dream a reality. In just eleven years, this method of microfinance for the poor has reached 100,000,000 of the world's poorest, and helped many of them lift themselves out of poverty. This isn't charity, it is a powerful tool for unleashing the creative talents of people who previously didn't have access to this opportunity. Skeptical? Consider this: the original Grameen bank in Bangladesh has now lent billions of dollars to millions of the poorest people on earth. The loans are made with no collateral and no documents are signed. This is happening in a region of the world that is highly susceptible to natural disasters like cyclones and massive flooding. And yet they have achieved an astonishing 98.5% repayment rate (far superior to regular commercial banks), they are profitable, and they are now self-sustaning, supporting their rapid growth through the deposits of their customers, the same customers who were once some of the poorest people on earth. This success, which began with a $27 out-of-pocket experiment, is being replicated around the world. Muhammad Yunus believes that access to credit should be considered a basic human right. This is the way to a world we can all be proud to live in. We simply can't tolerate poverty, we simply can't tolerate children dying from malnutrition. Today this is the norm; within fifty years it could be a bad memory. We believe that poverty does not belong in a civilized human society. It belongs in museums. To me, a world without poverty means a world in which every person can take care of his or her basic life needs. In such a world, nobody would die of hunger or suffer from malnutrition. This is a goal world leaders have been calling for for decades, but they have never set out any way of achieving it. Each day, some 35,000 children around the world die from hunger-related diseases. In a poverty-free world, no children would die of such causes. All people would have access to education and health-care services because they would be able to afford them. All state organizations that provide free or subsidized serviced for the poor could be done away with. There would be no need for welfare agencies, handouts, soup kitchens, food stamps, free schools, free hospital care. There would be no begging in the streets. State-run safety-net programs would have no rationale to exist. State-run social security programs and income-support programs would be unnecessary. Social structures in a poverty-free world would, of course, be quite different from those that exist today. But nobody would be at the mercy of anyone else, and that is what would make all the difference between a world without poverty and one riddled with it. Finally, a poverty-free world would be economically much stronger and far more stable than the world is today. The 20 percent of the world's inhabitants who currently live a life of extreme poverty would become income earners and income spenders. They would generate extra demand in the market, spurring growth in the world economy. They would bring their creativity and innovations into the marketplace to increase the world's productive capacity. As we proceed through the early days of this new millennium, it would serve us well to strive toward the daring Millennium Development Goals set by the Millennium Summit of world leaders at the United Nations in June 2000. The most daring of those goals is an entirely achievable one: halving poverty by 2015. I am totally convinced from my experience of working with poor people that they can get themselves out of poverty if we give them the same or similar opportunities as we give to others. How did we define "poverty-free"? After interviewing many borrowers about what a poverty-free life meant to them, we developed a set of ten indicators that our staff and outside evaluators could use to measure whether a family in rural Bangladesh lived a poverty-free life. These indicators are: (1) having a home with a tin roof; (2) having beds or cots for all members of the family; (3) having access to a sanitary latrine; (5) having all school-age children attending school; (6) having sufficient warm clothing for the winter; (7) having mosquito nets; (8) having a home vegetable garden; (9) having no food shortages, even during the most difficult time of a very difficult year; and (10) having sufficient income-earning opportunities for all adult members of the family. Some need only $20, others $100 or $500. Some want to husk paddy. Some want to make puffed rice. Some make earthenware pots and pans, while others buy cows. But—and note this, development specialists around the world—not one single Grameen borrower requires any special training. They either have already received this training as part of their household chores or have acquired the necessary skills in their field of work. All they need is financial capital. [Professor Georgescu-Roegen] also taught me that things are never as complicated as they seem. It is only our arrogance that prompts us to find unnecessarily complicated answers to simple problems. For more information about the Grameen Foundation, visit https://grameenfoundation.org⩘ . 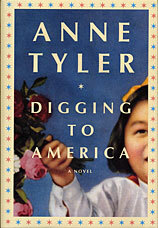 An important book that personalizes in a highly compelling voice a tragedy the West is doing a very good job ignoring. 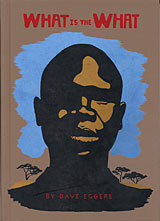 While we walk alongside Valentino Achak Deng on his epic journey of nearly unimaginable hardships, we should remember that, while this book is labeled a novel, this is a true story of our time, the tale of a genocide exacerbated by our thirst for oil. Yet for all of the sorrow and suffering this story reveals, ultimately it is the story of a courageous and good-hearted young man who perseveres in the face of seemingly insurmountable challenges. Easily the best book I've read this year. Although it's entertaining in flashes, there's simply too much detail about too little story for my taste. There's much about this book I like; I appreciate the forward thinking and the creative possibilities that are presented. But there's something about its tone I don't like; it's a bit too polished, like an over-practiced Marketing presentation. For example, the authors tell a story, with a self-congratulatory attitude, of creating a natural fabric. They boast that the water going out of the factory is cleaner than the the water coming in, leading regulators to wonder if their instruments were broken. Yet they conveniently slide past a key question: if the water is cleaner going out, where have the contaminants it has lost gone? Are they in the fabric? Is some other type of waste being created that contains those contaminants? If so, where is it going? Landfill? Smokestack? Tell me the whole story; otherwise, I'm being asked to buy in on faith, and that doesn't work for me. That mini-rant aside, this is a book well worth reading. Exert intergenerational responsibility. In 1789 Thomas Jefferson wrote a letter to James Madison in which he argued that a federal bond should be repaid within one generation of the debt, because, as he put it, "The earth belongs … to the living … No man can by natural right oblige the lands he occupied, or the persons who succeeded him in that occupation, to the payment of debts contracted by him. For if he could, he might, during his own life, eat up the usufruct of the lands for several generations to come, and then the lands would belong to the dead, and not to the living." The context is different, but the logic is beautiful and timeless. Ask: How can we support and perpetuate the rights of all living things to share in a world of abundance? How can we love the children of all species—not just our own—for all time? Imagine what a world of prosperity and health in the future will look like, and begin designing for it right now. What would it mean to become, once again, native to this place, the Earth—the home to all our relations? This is going to take us all, and it is going to take forever. But then, that's the point. The Menominee tribe of Wisconsin, wood harvesters for many generations, use a logging method that lets them profit from nature while allowing it to thrive. Conventional logging operations are focused on producing a certain amount of carbohydrate (wood pulp) for use. This agenda is single-purpose and utilitarian: it does not count how many species of birds the forest may harbor, or how its slopes stay stable, or what occasions for recreation and respite—as well as resources—it provides and could continue to provide to future generations. The Menominee often cut only the weakest trees, leaving the strong mother trees and enough of the upper canopy for squirrels and other arboreal animals to continuously inhabit. This strategy has been enormously productive; it has allowed the forest to thrive while supplying the tribe with commercial resources. In 1870 the Menominee counted 1.3 billion standing board feet of timber—what in the timber industry is tellingly known as "stumpage"—on a 235,000-acre reservation. Over the years they have harvested 2.25 billion feet, yet today have 1.7 billion standing feet—a slight increase. One might say they have figured out what the forest can productively offer them instead of considering only what they want. All the fuss about the recently released movie version of this book piqued my curiosity. While it is undeniably well written, I'm astonished by what a vile story it is. I'd rather stare out the window than read books like this. Though I've never had malaria, several times in my life I've experienced the delirium of intense fevers, strange gifts of fragmentary memory from childhood, Ethiopia, India. The imaginary episodes I witnessed during those fevers had a quality of diamond clarity; however, the stories were utterly nonsensical. Ghosh knows these deliriums well. This whole book is experienced from within the state of delirium of the various characters. Brilliantly executed. But utterly nonsensical. Malaria works on the brain too, in different ways: that's why falciparum malaria is also called cerebral malaria. But other kinds of malaria have weird neural effects too. A lot of people who've had malaria know that: it can be more hallucinogenic than any mind-bending drug. That's why primitive people sometimes thought of malaria as a kind of spirit possession. For anyone who doesn't have the time or inclination to read the 500+ page report of the 9/11 Commission, this is a gift. This graphic novel summarizes the key events and findings. It captures the horrors, heroism, and blunders, and provides ideas for a way forward. The final, sobering page of the book displays the report card that the Commission issued on December 5, 2005 rating how well the government has implemented the recommendations of the 9/11 Report. Any kid who brought home a report card like this would catch hell. Why has there been such a lack of basic accountability of the part of our government? I was looking around for some actual studies that measured whether adding graphics to documents made them more usable when I came across a reference to this book on the Society for Technical Communication website (www.stc.org). I had a bit of trepidation as I ordered the book—it is relatively expensive, and I presumed I would find it dry and mostly uninteresting—but I figured it might give me some of the information I wanted. 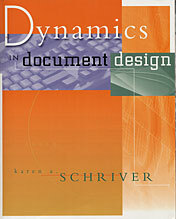 Once I received the book I jumped to the chapter that most directly discussed using graphics in documents. I was surprised to find that I liked what I was reading, so much so that I ended up reading the rest of the book and learning much. I'm particularly interested in Schriver's protocol-aided audience-modeling method [PAM] of learning how to become better at anticipating problems readers may have with the text being written and revised. 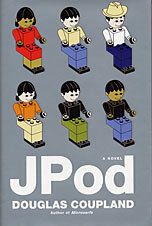 My only two minor criticisms of this book are that it is a bit wordy, and the cover design is unimaginative and trite. I can't believe they didn't use the fascinating graphic on the endleaves for the cover itself. Conover provides an invaluable perspective on the issue of migrant workers. It's so easy to slap a label on these people: are they "illegal aliens" or "migrant workers"? One of the most powerful portions of the story is when Conover takes us Ahuacatlán to see these many men (and the fewer women), who are so faceless and hidden when they are visiting the U.S. to work, as the fathers, mothers, brothers, sisters, sons, daughters, uncles, and aunts they are when they are at home, looked up to, understood, and respected. A book every American should read as we, once again, debate this important issue, too often with political sloganeering rather than reasoned insight. To get to know Mexicans you need to speak their language, be willing to put up with living conditions less comfortable than our own, and, especially if you look and were raised differently from them as I was, you need to believe in the subversive idea that a human is a human, and that human beings everywhere, with a little effort, can come to understand and even like each other. Like most previous waves of immigration, Mexican immigration leaves some citizens worried that there are becoming too many of "them," and not enough of "us," that we as a nation may drown in the tide of foreignness. Bit if there is any truism about immigration to America, it is that "they" soon become "us"; and that for two hundred years our strength and vigor have been due precisely to the energy and aspiration of immigrants. This is as true today as it was in the early 1920s, or during the previous century. "The United States," wrote Nathan Glazer in 1985, "remains the permanently unfinished country." 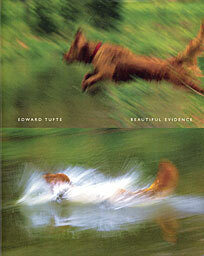 Tufte has crafted another exceptional book about visual information. Once again, the book itself is as beautiful as what he presents. His sections on the Hypnerotomachia Poliphili by Colonna and Sidereus Nuncius of Galileo are as visually beautiful as the evidence he is presenting. His return to Minard's Figurative Map of the successive losses in men of the French Army in the Russian Campaign 1812 - 1813 brings fresh insight into the fundamental principles of analytical design that make this 2D drawing more horrifying, when studied carefully, than any Hollywood depiction of battle has even been. There are very few non-fiction books that carry me along as easily as Tufte's books, which keep me immobile at my desk, making me forget the hours, and provoking my imagination to wander. And what a gorgeous cover, especially seen in its entirety. An excellent book about the wiki phenomenon, including two large sections dedicated to the details of deploying and administering MediaWiki and TWiki. The appeal of wiki technology lies in the act of rethinking the familiar. Once again, hierarchical control modes are at our disposition, and with them, valid ideas of why and how, through the division of labor, complex problems can be solved and products produced and distributed. It is no less than a question of other socialization models whose possibility becomes apparent. …it could help to remember that the issue of ownership does not focus on the relationship between a person and a thing, but rather the relationship between people with reference to a thing. Good will alone is not enough. That is why wiki systems must develop assessment possibilities and conventions that promote verification and trackability. Once again, Wikipedia, for which a package of such measures has been developed, serves as a positive example. Initially, many people look at the articles in the encyclopedia. Ideally, they would immediately edit any discrepancies. Then admins check the edits of articles. The recent changes function offers a quick overview. In addition, frequently vandalized pages are placed under special supervision. This permanent effort is the price of an open system. Furthermore, conventions regarding language, methodology and balance of content have been stipulated, for example, with regard to the extent to which every opinion should be cited in an article. This is the point where the Wikipedia community conducts its debate on the relationship between objectivity and partiality, which equally applies when dealing with every other medium. We are talking about the debate on the neutral point of view (NPOV). Basically, it states that articles in Wikipedia are to take a neutral viewpoint into account. This initially means a minimum of quality measures and the adherence to certain conventions: objective language, a reporting perspective and indirect speech. I've read many of Anne Tyler's books over the years and, though this isn't one of my favorites, I continue to be in awe of the insight with which she reveals the rhythms of ordinary life. Walter Mosley is the most intense writer I read. I think I've read every book he's written. Some, like his Easy Rawlins books, are easy reads, yet even those throb with an underlying intensity. 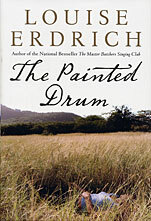 Others, like this one, are challenging reads. Mosley takes us deep into the raw, festering wounds of our society, forcing us to look at the pus and smell the rot. And he helps us to see the glimmers of light that shine from the souls of people mired in our worst cesspools. A good overview of the tools of the read/write Web. The extent of our collective knowledge doubles every 18 months (Olofson, 1999), and as more and more information comes online, it's imperative that we give our students the skills to analyze and manage it. The differences between blogging in this manner and writing as we traditionally think of it are clear: Writing stops; blogging continues. Writing is inside; blogging is outside. Writing is monologue; blogging is conversation. Writing is thesis; blogging is synthesis … none of which minimizes the importance of writing. But writing becomes an ongoing process, one that is not just done for the contrived purposes of the classroom. That's how each of Widipedia's more than 860,000 entries has evolved, from the hands of people just like us with the concept that everyone together is smarter than anyone alone. In the process, we check facts, provide "soft" security by acting like a community watchdog, and weed out bias and emotion from the posts in an attempt to arrive at a neutral point of view for each article. Each entry is the group's best effort, not any one person's. On his own blog, Paul [Allison of East Side Community School in Manhattan] says, "To write in a wiki is to compose within a living organism" (Allison, 2005). In the process of creating this community, you are participating in the creation of a new way of organizing information as well. This is another one of those dramatic shifts the Read/Write Web is bringing about. Back in the old days, we used to rely on librarians and others to sort and categorize information for us. These traditional taxonomies have been with us for a long time and they worked well because the sorting was being done by trained professionals who used a consistent process. That's why we're usually able to find what we're looking for in a library or on subject-specific search site like Yahoo! But today, when we now have the power to organize vast libraries of information on our own, the process is being run by millions of amateurs with no real training in classification. Not to worry, however, because as with many topics on the new Net, users of social bookmarking systems have created a new concept to deal with the change: The process is no longer taxonomy but "folksonomy." The idea is that in working with your community of researchers, new tagging systems will emerge and become accepted that will allow us all to participate in the process. Although this might be seen as chaotic and not as effective as traditional methods, by being able to apply many tags to one particular link we get the added potential of seeing how others might interpret or use resources that we share. Thus we get connected to information in ways that traditional libraries cannot duplicate. And the more people contribute in the creation of folksonomies, the more valuable they become to all who participate. An excellent look at how we can make our information findable or, really, how we can partially let go of our control over our information and allow it to be become more findable by letting the vast pool of information consumers assume a stake in the information through mob indexing and folksonomies. This is a real "Aha!" book; it cruises at a high enough altitude to not get lost in the forest of arguments, yet swoops down often enough to let us glimpse some amazing new flowers that are blooming on the forest floor. And I think it explores vividly a vital premise: information is alive. Of course, there are fundamental differences between physical and digital realms…. But for now, let's conclude our focus on the built environment by acknowledging a theme the courses through the literature of wayfinding and usability alike; the vital importance of empathy for the user. Only by understanding and caring about the perspective of the individual can we design useful, usable solutions. Only by designing for emergent patterns of use that flow from common needs, desires, instincts, and behaviors can we create shared spaces that unite form and function. Wow, it must have been amazing to study under Itten; he truly breathes his subject. In no human activity is talent as decisive as in the field of education. Only the talented educator—I mean talented for education—will respect and guard the indescribable wonder of humanity in every child of man. Respect for human beings is the beginning and the end of all education. Education is a bold venture, especially for art education, which deals with man's creativity. 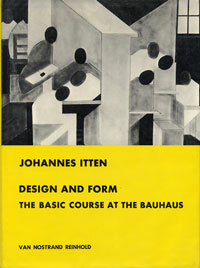 From a manifesto about the aims and ways of the Bauhaus written by Walter Gropius: "The ultimate aim of all design activity is the building… Architects, sculptors, painters, we all must go back to the handicraft… There is no essential difference between artist and craftsman, the artist is a heightened craftsman… The foundation of craftsmanship is, however, indispensable for every artist. There is the fountainhead of creative design." But the void within them creates the essence of the wheel. But the void within them creates the essence of the pot. But the void within them creates the essence of the house. If a genuine feeling is to be expressed in a line or plane, this feeling must first resound within the artist. Arm, hand, finger, the whole body, should be permeated with this feeling. Such devotion to work requires concentration and relaxation. The story has an interesting enough dual-universe premise, but Ambrose never quite manages to light the fuse on this one. This is a quite book, a slowly told tale of mostly ordinary moments. While there are a few shocking events, it is the quietness, the ordinariness that powers this story. Each of us is on a journey through life; this is the story of some of our fellow travelers. Life will break you. Nobody can protect you from that, and living alone won't either, for solitude will also break you with its yearning. You have to love. You have to feel. It is the reason you are here on earth. You are here to risk your heart. You are here to be swallowed up. And when it happens that you are broken, or betrayed, or left, or hurt, or death brushes near, let yourself sit by an apple tree and listen to the apples falling all around you in heaps, wasting their sweetness. Tell yourself that you tasted as many as you could. As I read toward the end of this book, I found myself wishing there were more pages to turn. A rich and well told story about decisions and consequences. That much was true. Peter had learned his gift to be gentle and caring with the elderly from his dealings with his grandfather. In Berlin, he rediscovered his talent and the transformative effect of being listened to. Old age, which brought with it so many indignities, he found he was able to suspend. Past achievements were not distant achievements, but right there in the room with the patient. He refused to allow anyone to identify too closely with their bodily functions. Old age, said his eyes, was an unfortunate inevitability, but it wasn't personal, and with his sigh he participated in the dismay of those who wet themselves or needed help to put in their teeth, while acknowledging that it wouldn't be long before he would be crapping in his bed too. A not quite convincing exploration of the boundaries of genetic manipulation and the edges of madness. I was enthralled reading this story. 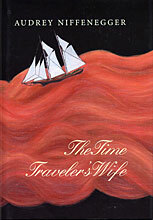 Ms. Niffenegger manages to make the extraordinary seem plausible and the ordinary seem fantastic. As I wrap my hair in a towel I see myself blurred in the mirror by steam and time seems to fold over onto itself and I see myself as a layering of all my previous days and years and all the time that is coming and suddenly I feel as though I've become invisible. Unconvincing characters in a depressing story. For me, it fell short of her earlier effort. Somewhat clever book, but I didn't find it as interesting as his first. I feel it is important for me to read and learn from books like this—at its core, I believe technical communication is customer service—but there is something about these kinds of books I find totally distasteful. How to write a marketing/sales/customer service book: first, think up a catchy phrase like, say, Branded Customer Experience®. Next, make a list of all the currently successful companies in the world. Then, find a way to show that what those companies do to be successful hinges on your catchy phrase. Finally, repeat the catchy phrased ad nauseam and just to make sure nobody misses the link to your personal brilliance, tag it with the registered trademark symbol each and every time. Of course, there is a danger in associating currently trendy and successful companies with your trademark and filling your book with stories by the people running these companies telling us what a brilliant job they are doing making their companies great. For one thing, one of the companies, say a wildly successful donut company, could turn out to be a house of cards that comes tumbling down after your book goes to press. Okay, enough bitching. This book actually has a lot of good content and was worth reading despite my allergic reaction to parts of it. And even if the book sings the praises of Krispy Kream, that too is good: it keeps us from taking any of this stuff too seriously. When organizations see the sale as the beginning of a lifetime relationship rather than the end of a transaction, then you know that the customer experience is well and truly on the management agenda. The quality of the illustrations in the book is terrible, which detracts from the value of the book. And the author interjects too much of his own preachy morality into the mix. Still, I got what I wanted out of the book: a quick-start introduction to architecture. We have a special project at work that I'm getting involved in called Project Spectrum. The goal is to create a version of our software designed specifically for kids with autism. A colleague working on the project recommended this book to me. I'm really grateful she did. This is an incredible, multi-dimensional book. Prince-Hughes writes very beautifully about her life, her autism, her relationship with the gorillas she has known, and about the difficult challenge that people with autism face in today's world, as well as the desperate challenge that the gorilla people face. Her coverage of any one of these topics would have made for a rich and rewarding read; together, they combine into a stunning book. From the opening lines through the final words I have been in awe. And then, in an instant, it happened. We put our fingers down at the same time. His gigantic finger, black and leathery, soft and warm, rested on my own digit. We stared at our fingers, and neither of us moved. Finally, I looked up into his soft brown eyes. They were dancing with surprise. We stayed like that for what seemed like a long time, our fingers joining five millions years of evolution and reaching out to bridge the gap of generations traveled. He leaned forward slowly until he was six inches from my face. I could feel his breath. His steady eyes peered into my soul, and he did not blink. I leaned forward and rested my forehead on the bars. Our faces were almost touching. We stared at each other, our fingers still together. I relaxed into his touch and nearness. This is what it is, I thought. This is what it means to love and be loved. This is what it is to touch and look at another person and feel its meaning. This is what it is to not be alone in the vastness of the space we hurtle through among the coldness and the dying. This is what is is to live, I thought. At the beginning of this year I began a new job with @Last Software whose flagship product is SketchUp, a very playful, easy-to-use 3D drawing program (the company's motto is "3D for Everyone"). If you've seen the Crafting portion of my site you already know how much I live in the world of 3D, but you might be surprised to learn that I had never used a 3D drawing program. I've worked with a physical modeling system called Zometool, but my drawing had been limited to 2D applications like Adobe Illustrator (a neighbor who uses a traditional CAD program had scared me away from 3D with tales of complexity and cost). So you can imagine my delight when I started using SketchUp. At the end of one of my first days at work I walked up to our VP of Engineering, pulled out my wallet, and asked him how much I owed him for getting to play with SketchUp that day! 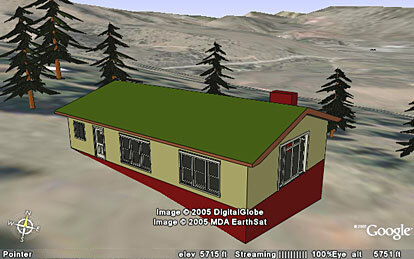 Then it really started to get fun: one of my very first projects was to write a document describing a new, free SketchUp plugin that lets you place a SketchUp drawing at a precise location in Google Earth. As a way of becoming familiar with the process I was writing about I sketched a preliminary model of a simple cabin to be located on a bit of open land just behind our home. I don't think I can begin to adequately describe how amazing an experience it was for me to see that cabin in its proper location in Google Earth, and to be able to circle around it to see what the views would be like. I simply marveled at how effortless it was to translate my imagination into a 3D model in context (even for a total rookie like me, the entire process took only a matter of an hour or so). I have to tell you, that was the most fun I've ever had writing a technical document. 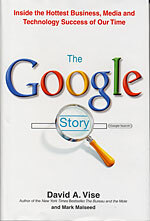 When I heard Google would be acquiring @Last, I picked up this book. The thing I read in this book that surprised me the most is how much of a hardware company Google is. I had never thought about this and was fascinated to read about the vastness and cleverness of their computer system. The thing that impressed me the most is how long a view Google takes. Much of today's business world seems to be primarily focused on quarterly results, which can exert a creativity stifling influence on a company and its employees, so it is extremely refreshing to discover a company that thinks about some of its projects in terms of years, decades, and even centuries. The thing that made me realize that I'm really going to love working at Google is their focus on the user; that makes me feel like I'm coming home. "So optimism is important," he went on. "You have to be a little silly about the goals you are going to set. There is a phrase I learned in college called, 'Having a healthy disregard for the impossible,'" Page said. " That is a really good phrase. You should try to do things that most people would not." Industry veterans noted qualities about Google's approach that distinguished it in major ways. For example, its work was not motivated by fighting with a business adversary and it avoided the temptation to create an archrival. "Google is not anti-anybody," said Jon Miller of AOL. " Most companies need a business enemy, and that is how they motivate themselves." Brin and Page, on the other hand, "are motivated by their mission. Clearly, they think very differently and are driven by their vision and business goals." Lee himself outlined the reasons for his wanting to join Google on a Chinese Web site read by thousands of engineering students. Formatting his statement as a math equation, he wrote: "youth + freedom + transparency + new model + the general public's benefit + belief in trust = The Miracle of Google." The pair [Sergey and Page] is also invovled in the hunt for clean, renewable energy sources to power Google and broaden economic growth. "These guys have a big, compelling vision for what the company is going to do," said Stanford president John Hennessy. "They think very hard about the long term." … Page also foresees greater involvement for himself and Google in causes that work to relieve hunger and poverty through entrepreneurship, self-reliance, and philanthropy. He has taken a particular interest in programs that provide small bank loans to people in developing nations. "Mohammed Yunus in Bangladesh has given out over $2 billion now, $160 at a time, to poor people and been very successful," he said. "The money gets returned and it is a functioning business." He added, "I believe eliminating poverty is something we could do."